On my very first day at CKU, I had a class that was called "Did I mention it's about me? ", an album by Rusty Pickle. I was like freaking out, so happy to be there, just walking around the corridors of the hotel's convention center smiling. The the class started. We got all this cute kit with papers and ribons and red flowers, and I couldn't believe I was actually there. That's when I met this cute cute girl, our teacher for the evening, Kim. Such a sweet person! Mom of three boys, and she looks like she's 18 years old! Cute cute! She was so nice to everybody, and really did a great job with the instructions for the album. Later that day, at the crop, we had a chance to talk more. And boy, we like to talk, right, Kim? She was one of the few who, like me, stayed at all the crops until they kicked us out! It is so amazing to meet someone that lives so far away, and has such a different life, but at the same time, face the same challenges and joys. 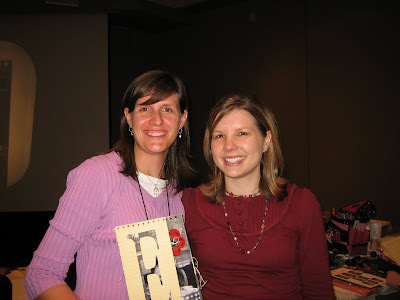 We talked so much about kids, and scrapbooking, and Ali, and being a mom, and being creative, well, it was pretty amazing. So, Kim, I miss you already! Keep in touch! Lynn was TA at Kim's class, and also a midnight scrapper at the crops. She has so many beautiful albums, really, you have to see it. 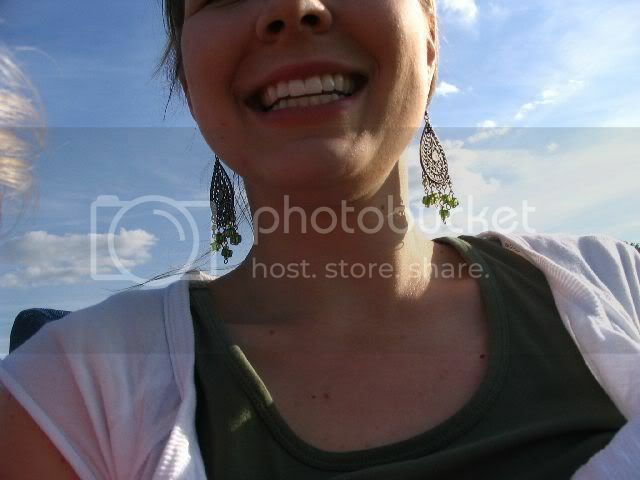 Always smiling, always having fun! 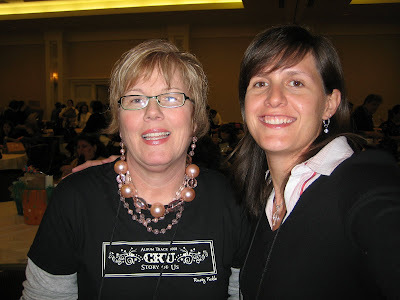 Lynn, I loved meeting you! She really was a great TA too, running up and down the stairs in the amphitheater, I can only imagine how tired you were after that! 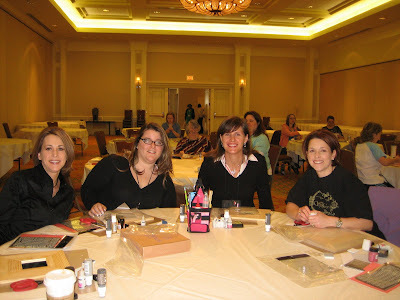 This picture was taken at Tim Holtz's class, and the lady in the left of the picure is Jane. She was the one that shared with me an amazing moment in this CKU. My birthday was friday, and my husband sent me a box of chocolate covered strawberries, my very favorite thing! He ordered on line, and Jane was the one who was with me when the box arrived. There were tears, and smiles, and chocolate. And we were in the same classes on friday, so we had a chance to talk a lot. Jane, I loved spending this time with you, if you read this, please send me that picture of the two of us! Que delícia de fotos. E que bom que vc esteve com a Ju e a Olímpia. Me lembrei do meu CKU. Um barato! You Rocked at CKU!!! Come and visit my blog!!! Your new friend, Lynn! Vou ter que ir no próximo!!! Parabéns pela linda viagem Dé. Aaahhh! I am so honored by this post. I will never forget the 'talk' we had about kids and being moms....you are an inspiration! Have I said this enough yet? Love ya!